Cross-section of the upper ocean crust. Blue and red arrows show cold seawater and hot hydrothermal fluid circulation, respectively. 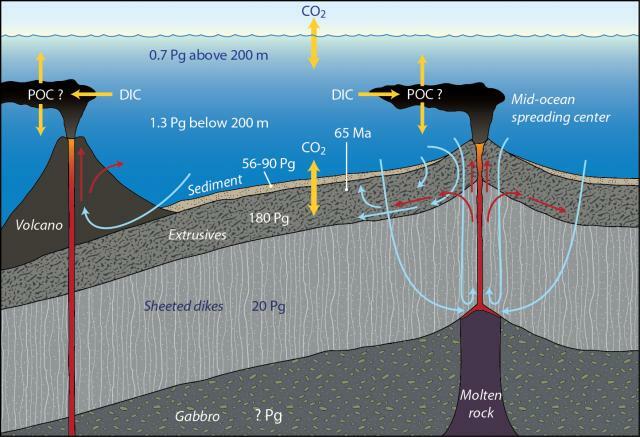 The yellow double arrows indicate CO2 exchange between the atmosphere, the deep ocean, and the subsurface. The numbers indicate the estimated amount of bacterial and archaeal carbon in Pg (10^15 g) in different regions of the oceans and the rock age where hydrothermal fluid circulation in the crust ceases (65 Ma). DIC and POC stand for dissolved inorganic carbon and particulate organic carbon, respectively.